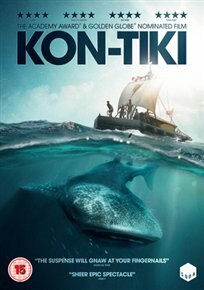 Academy Award-nominated Norwegian drama based on explorer Thor Heyerdahl’s 1947 expedition in which he journeyed across the Pacific Ocean on a raft from South America to Polynesia. Heyerdahl (Pål Sverre Hagen) aims to prove his theory that the Hanau epe, an ancient Peruvian tribe, settled on the Polynesian islands 1500 years ago. To do so, he builds a raft named Kon-Tiki which resembles the type of vessel the tribe would have had the technology to make. Then, with five crew members and a parrot he sets off from Peru and takes to the ocean, despite the fact he is unable to swim or sail, to show that such a journey would have been possible even in the pre-Columbian era. During the 4300 nautical mile-voyage he and his crew encounter numerous difficulties. Will they make it safely to Polynesia and prove Heyerdahl’s theory?